Got a lot of luggage to take with you? Then why not ship it to your destination with Send My Bag? This means you can avoid the hassles of travelling with luggage, including the possibility of incurring high excess baggage fees. Find out how much you can save by sending your luggage. One personal item measuring no more than 40 x 30 x 20 cm and weighing max. 10 kg, free of charge. Priority customers may also bring on board a 10 kg trolley bag, providing it measures no more than 55 x 40 x 23 cm. Wizz Priority costs between €5 and €15 online, and €25 at the airport. Compare Wizz Air's hand luggage allowance to that of other airlines. If you wish your infant to remain in its car seat during the flight, you will need to purchase a seat for it. Only rear-facing car seats can be used. Collapsible buggies can be brought to the door of the plane, where they will be checked into the hold for free. Wizz Air passengers travelling with infants may bring an extra personal item on board. A musical instrument measruing 55 x 40 x 23 cm can be brought on board as hand luggage. A larger instrument up to 80 cm in length, and with other dimensions no greater than 40 x 23 cm, can brought on board if a seat is purchased for it. Up to six 23 kg or 32 kg bags, charged. Bags must measure no more than 149 cm x 119 cm x 171 cm. Allowances for up to three 23/ 32 kg bags can be purchased online and a further three at the airport. The cost of a 20 kg allowance ranges from €14-€70 and the cost of a 32 kg allowance ranges from €19 - €120, depending on the season of travel and where you purchase your allowance (online/ call centre or at the airport). You can also check a 10 kg bag into the hold, with prices starting at €7. If you have pre-paid for a 20 kg bag, but your bag is found to be over this weight at the airport, you will be charged €10 per extra kilogram. Infants do not receive a baggage allowance, except for a pushchair/ car seat, free of charge. Sporting equipment is subject to an additional fee of €30, per item, one way, online or via telephone or €60, per item, one way, at the airport. Today sees Wizz Air's new baggage rules rolled out. They mean passengers will only be able to bring a small personal item on board as hand luggage, free of charge. In order to bring a larger bag into the cabin, Wizz Priority must be purchased for between €5 and €25. Wizz Air has changed its hand luggage policy. As of 1st November, Wizz Air will permit one personal item only as free hand luggage. This item must measure no more than 40 x 30 x 20 cm and weigh no more than 10 kg. 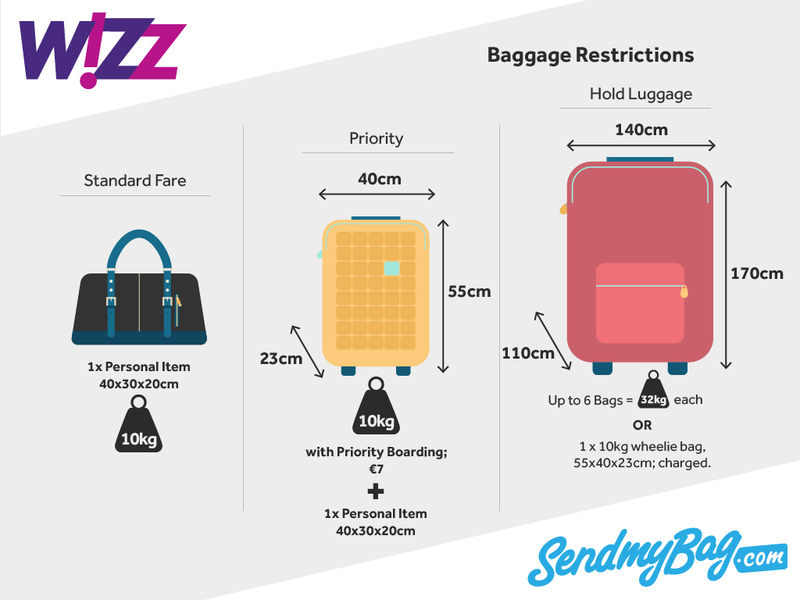 Following in Ryanair's footsteps, Wizz Air are encouraging customers to purchase Wizz Priority, as this will allow them to also bring a larger 10 kg trolley bag on board, as long as it measures no more than 55 x 40 x 23 cm. Looking for Wizz Air sized hand luggage?